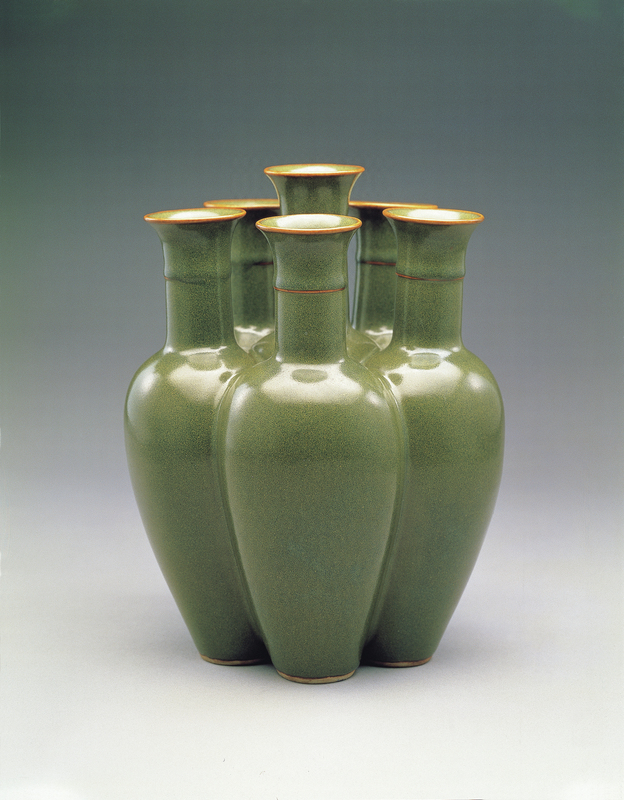 This unusual vessel consists of five conjoined vases of the same shape and size circling around a central main vase, forming a single complete vase. The cross-section of the vessel indicates that the interior of the six vases is joined together, with only the slender necks helping to exaggerate their individuality. Of particular note is the evenness of the height of the five surrounding vases and the slightly taller central vase, appropriately emphasizing it as a work composed of six vases joined together. Each neck is decorated with a fine ring, but the bodies are otherwise undecorated. The surface is covered with a glaze in the color of tea dust, the hue becoming slightly deeper where it gathered and thickened. The places where the glaze is thinner appears yellowish-green in color. The bottom of this vessel is engraved with a six-character inscription in seal script that reads, "Made in the Qianlong Reign of the Great Qing Dynasty." Multiple paired and quadruple conjoined vases had already appeared among official wares of the Yongzheng reign (1722-1735), but in the Qianlong reign, this form was developed even further, creating a great variety of new vase combinations that fused both advances in ceramic technology with the imagination of craftsmen. Indeed, a cross-section of this vase would show just how intricate the combination of forms is. The main vase form, before being fired, would have holes cut out for the other five vases, which were then seamlessly added to the form and then fired. The sizes of the five subsidiary vases are almost exactly the same, a very difficult feat, and they are matched perfectly onto the main vessel form. Such precision in ceramic design and technique are a feature of official wares of the Qianlong reign.